CoinGecko is happy to announce that we are partnering with Axie Infinity, a leading blockchain-based gaming decentralized application. Axie Infinity makes use of Non-Fungible Tokens (NFT) to store in-game assets. We at CoinGecko see strong growth in NFTs and have covered this topic extensively in our 2018 Full Year and 2018 Q3 Crypto Report. Axie Infinity is a blockchain start-up which creates decentralized applications. Currently creating Lunacia – an open world owned, operated, and controlled by players. Lunacia is divided up into tokenized plots of land, called Terra, which can be purchased, rented out, and developed by players. Landholders can upgrade and customize their territory to host shops, Chimera summoning beacons, produce resources, house NPC’s, and even act as access points for dungeons! Independent developers, content creators, and companies will be able to seamlessly build on top of Lunacia using clickable wormholes as a launchpad for this content. The possibilities are infinite! For more information, visit https://axieinfinity.com/. 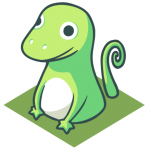 To celebrate this partnership, Axie Infinity will release CoinGecko-themed time-limited, epic Terrarium Item. CoinGecko and Axie Infinity fans can collect these NFT and enjoy special in-game benefits to gain an edge in their gameplay. When I want to sign up for https://gleam.io/I3d3k/coingecko-axie-infinity-giveaway I need to authenticate my Twitter account and I get a notification: Authorise Gleam Competition App to use your account? I’m not sure if I can agree with that. For example if an automated app will use my account for posting tweets and updates my profile maybe Twitter will disable and suspend my account because of suspicious behaviour?